This article describes navigation options sites with SharePoint Publishing enabled in SharePoint Online. The choice and configuration of navigation significantly impacts the performance and scalability of sites in SharePoint Online. Navigation provider configuration can significantly impact performance for the entire site, and careful consideration must be taken to pick a navigation provider and configuration that scales effectively for the requirements of a SharePoint site. There are two out-of-the-box navigation providers, as well as custom navigation implementations. 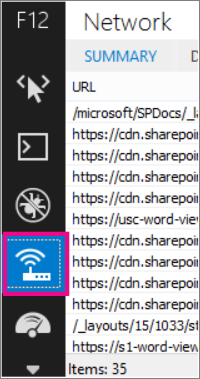 The first option, Managed (Metadata) navigation, is recommended, and is one of the default options in SharePoint Online; however, we recommend that security trimming be disabled unless required. Security trimming is enabled as a secure-by-default setting for this navigation provider; however, many sites do not require the overhead of security trimming since navigation elements often are consistent for all users of the site. With the recommended configuration to disable security trimming, this navigation provider does not require enumerating site structure and is highly scalable with acceptable performance impact. The second option, Structural navigation, is NOT a recommended navigation option in SharePoint Online. 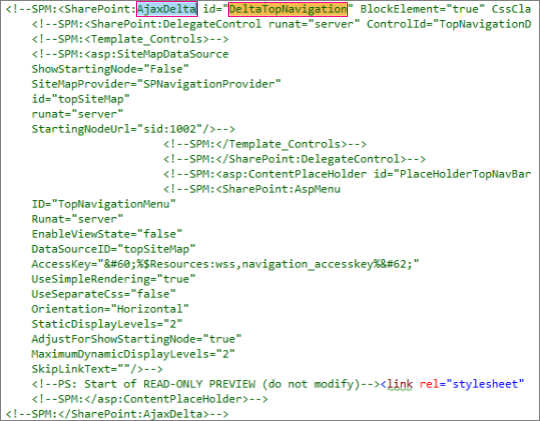 This navigation provider was designed for an on-premises topology has limited support in SharePoint Online. While it provides some additional set of capabilities versus other navigation options, these features, including security trimming and site structure enumeration, comes at a cost of excessive server calls and impacts scalability and performance when it is used. Sites using structed navigation that consume excessive resources may be subject to throttling. They generally work well with responsive page designs. They are extremely scalable and performant because they can render with no resource cost (and refresh in the background after a timeout). These navigation providers can retrieve navigation data using various strategies, ranging from simple static configurations to various dynamic data providers. An example of a data provider is to use a Search-driven navigation, which allows flexibility for enumerating navigation nodes and handling security trimming efficiently. There are other popular options to build Custom navigation providers. Please review Navigation solutions for SharePoint Online portals for further guidance on building a Custom navigation provider. The following table summarizes the pros and cons of each option. The most appropriate option for your site will depend on your site requirements and on your technical capability. If you want a scalable out-of-the-box navigation provider, then Managed navigation with security trimming disabled is a very good option. The Managed navigation option can be maintained through configuration, does not involve code customization files, and it is significantly faster than structural navigation. If you require security trimming and are comfortable using a custom master page and have some capability in the organization to maintain the changes that may occur in the default master page for SharePoint Online, then the Search-driven option may produce a better user experience. If you have more complex requirements, then a custom navigation provider may be the right choice. Structural navigation is NOT recommended. Finally, it’s important to note that SharePoint is adding additional navigation providers and functionality for modern SharePoint site architectures leveraging a more flattened site hierarchy and a hub-and-spoke model with SharePoint hub sites. This allows many scenarios to be achieved that do NOT require the use of SharePoint Publishing feature, and these navigation configurations are optimized for scalability and latency within SharePoint Online. Note that applying the same principle - simplifying the overall structure of your SharePoint Publishing site to a flatter structure, often helps with overall performance and scale as well. What this means is that instead of having a single Site Collection with hundreds of sites (subwebs), a better approach is to have many site collections with very few subsites (subwebs). Managed navigation is another out-of-the-box option that you can use to recreate most of the same functionality as structural navigation. Managed metadata can be configured to have security trimming enabled or disabled. When configured with security trimming disabled, managed navigation is fairly efficient as it loads all the navigation links with a constant number of server calls. Enabling security trimming, however, negates some of the advantages of managed navigation, and customers may choose to explore one of the custom navigation solutions for optimal performance and scalability. Many sites do not require security trimming, as the navigation structure is often consistent for all users of the site. If security trimming is disabled and a link is added to navigation that not all users have access to, the link will still show but will lead to an access denied message. There is no risk of inadvertent access to the content. There are several articles on Docs.Microsoft.com about the details of managed navigation, for example, see Overview of managed navigation in SharePoint Server. The following example shows the performance of the complex navigation using managed navigation. Using managed navigation consistently improves performance compared to the structural navigation approach. This is the out-of-the-box navigation used by default and is the most straightforward solution but as such has an expensive performance trade-off. It does not require any customization and a non-technical user can also easily add items, hide items, and manage the navigation from the settings page. This is however also true for Managed Navigation so it is recommended to use Managed Navigation as that can also be easily managed and controlled as well with improved performance. To illustrate how the performance in a standard SharePoint Online solution with structural navigation and the show subsites option turned on. Below is a screenshot of settings found on the page Site Settings > Navigation. 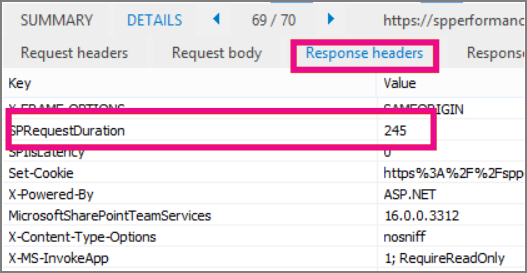 To analyze the performance of a SharePoint page, use the Network tab of the F12 developer tools in Internet Explorer. On the Network tab, click on the .aspx page that is being loaded and then click on the Details tab. SharePoint returns some useful diagnostic information in its response headers. The SPRequestDuration key has a value of 245 milliseconds. This represents the time it took to return the request. Since there is only one navigation item on the site, this is a good benchmark for how SharePoint Online performs without heavy navigation. The next screen shot shows how adding in the subsites affects this key. Adding the subsites has significantly increased the time it takes to return the page request for this relatively simple sample site. Complex site hierarchies, including pages in navigation, and other configuration and topology options can dramatically increase this impact even further. Using search you can leverage the indexes that are built up in the background using continuous crawl. The search results are pulled from the search index and the results are security-trimmed. This is generally faster than out-of-the-box navigation providers when security trimming is required. Using search for structural navigation, especially if you have a complex site structure, will speed up page loading time considerably. The main advantage of this over managed navigation is that you benefit from security trimming. This approach involves creating a custom master page and replacing the out-of-the-box navigation code with custom HTML. Follow this procedure outlined in the following example to replace the navigation code in the file seattle.html. In this example, you will open the seattle.html file and replace the whole element id=”DeltaTopNavigation” with custom HTML code. Navigate to the Site Settings page. Open the master page gallery by clicking Master Pages. From here you can navigate through the library and download the file seattle.master. Edit the code using a text editor and delete the code block in the following screen shot. 6. Replace the URL in the loading image anchor tag at the beginning, with a link to a loading image in your site collection. After you have made the changes, rename the file and then upload it to the master page gallery. This generates a new .master file. 8. The results are assigned to the self.nodes array and a hierarchy is built out of the objects using linq.js assigning the output to an array self.hierarchy. This array is the object that is bound to the HTML. This is done in the toggleView() function by passing the self object to the ko.applyBinding() function. The event handlers for mouseenter and mouseexit are added to the top-level navigation to handle the subsite drop-down menus which is done in the addEventsToElements() function. In our complex navigation example, a fresh page load without the local caching shows the time spent on the server has been cut down from the benchmark structural navigation to get a similar result as the managed navigation approach. //Parse a local object from the serialized cache. //Check local storage for cached navigation datasource. //Executes a REST call and builds the navigation hierarchy. //Uses linq.js to build the navigation tree. //Loads the navigation on load and binds the event handlers for mouse interaction. To summarize the code shown above in the jQuery $(document).ready function there is a viewModel object created and then the loadNavigationNodes() function on that object is called. This function either loads the previously built navigation hierarchy stored in the HTML5 local storage of the client browser or it calls the function queryRemoteInterface(). QueryRemoteInterface() builds a request using the getRequest() function with the query parameter defined earlier in the script and then returns data from the server. This data is essentially an array of all the sites in the site collection represented as data transfer objects with various properties. This data is then parsed into the previously defined SPO.Models.NavigationNode objects which use Knockout.js to create observable properties for use by data binding the values into the HTML that we defined earlier. The objects are then put into a results array. This array is parsed into JSON using Knockout and stored in the local browser storage for improved performance on future page loads. One major benefit of this approach is that by using HTML5 local storage, the navigation is stored locally for the user the next time they load the page. We get major performance improvements from using the search API for structural navigation; however, it takes some technical capability to execute and customize this functionality. In the example implementation, the sites are ordered in the same way as the out-of-the-box structural navigation; alphabetical order. If you wanted to deviate from this order, it would be more complicated to develop and maintain. Also, this approach requires you to deviate from the supported master pages. If the custom master page is not maintained, your site will miss out on updates and improvements that Microsoft makes to the master pages. The current version of LinqJS does not contain the ByHierarchy method used in the above code and will break the navigation code. To fix this, add the following method to the Linq.js file before the line Flatten: function ().